Have you ever roasted chickpeas? They are seriously good! 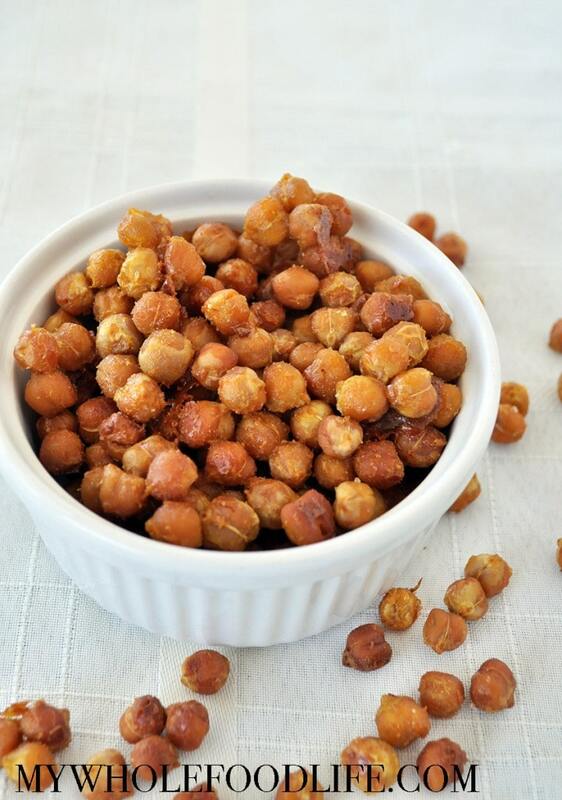 This Honey Mustard Roasted Chickpeas recipe is my latest creation, and they are out of this world awesome. When I was pregnant with my first daughter, I ate an obscene amount of honey mustard pretzels. This was before we started this “whole food life.” They were really good, but the ingredients are less than desirable. Well, I think I re-created the flavor in a healthier way with these honey mustard roasted chickpeas. If you love roasted chickpeas, check out my maple cinnamon roasted chickpeas, or my sriracha roasted chickpeas. For those of you that can’t get roasted chickpeas crunchy, let me tell you a trick I learned recently. Before you go to make these, lay the chickpeas on a baking sheet and let them dry out for a few hours. Once they have dried a bit, then mix in all the ingredients and bake. It really makes a difference! A healthier alternative to chips! In a small bowl, whisk together the mustard and maple syrup. Add the mixture to a large bowl with the chickpeas and mix well. You want to make sure all the chickpeas are coated in the honey mustard. Spread the chickpeas onto a lined baking sheet . Bake for 45-55 minutes. Make sure you pull the pan out every 10 minutes to shake the chickpeas around. This should prevent burning. These should last at least a week in the pantry. Enjoy!! what did you line the baking sheet with? what is the calorie count on these? I'm sorry, I don't know offhand, but you can upload the recipe into my fitness pal for a rough number. I like how I can use honey instead of maple syrup with these - its so much easier to fit into my student budget! Finally made them. So yummy Melissa! Yay!! Glad you liked them! Did you use powdered mustard or the condiment? Do you removed the skins of the canned chickpeas?